on August 27, 2018, 10:37 a.m. The lifting of the ban on women driving in Saudi Arabia is nothing less than a historical milestone. Close to a quarter (24%) of women have already applied for a driving license since the country started issuing licenses to female motorists in June 2018. Although the majority have not applied yet, 61% of those say they intend to apply for a driving license in the future. 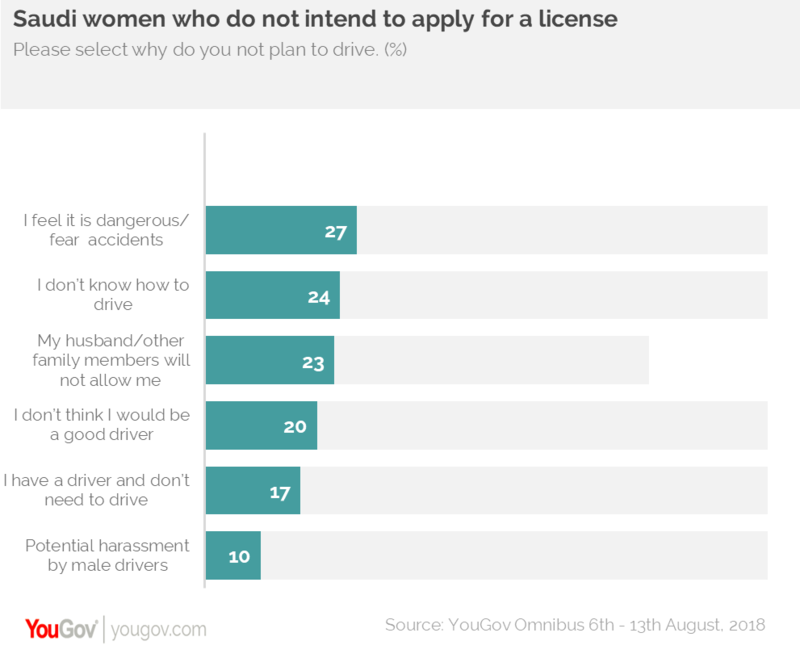 For those who have not and do not intend to apply for a driving license, fear of driving and safety concerns are the top reasons for not wanting to do so. Despite the country recently launching a campaign to educate women on driving and create awareness about safety regulations, this still remains a barrier for women trying to get behind the wheel. 27% feel it is dangerous and fear car accidents, 24% do not know how to drive and 23% believe their husbands/ family members would not allow them to drive. The lifting of the ban is not just a reason to rejoice for women but has opened a host of incremental opportunities within the auto market. Over three-quarters of women who intend to drive (78%) plan to buy a car. A majority (84%) say the decision of which car to buy rests in their hands. For those who are not the primary decision maker, almost half (48%) indicated their husbands will be making the decision and a fourth said their father-in-laws (25%) have the final say in the matter. While carmakers in the region are gearing up to rev up sales with the influx of additional drivers, this is a valuable insight for brands who want to target potential women purchasers and align their advertising and marketing campaigns to target the key decision makers. Although safety remains a dominant concern for females in the region, women who are embracing the opportunity seem most comfortable starting out with small cars. When women were asked which type of car they would like to drive, the largest proportion said small sized sedans (16%), followed by medium sized sedans (13%) and then medium SUVs (11%). Small cars are not just easy to park in high traffic areas but are also low on fuel consumption. 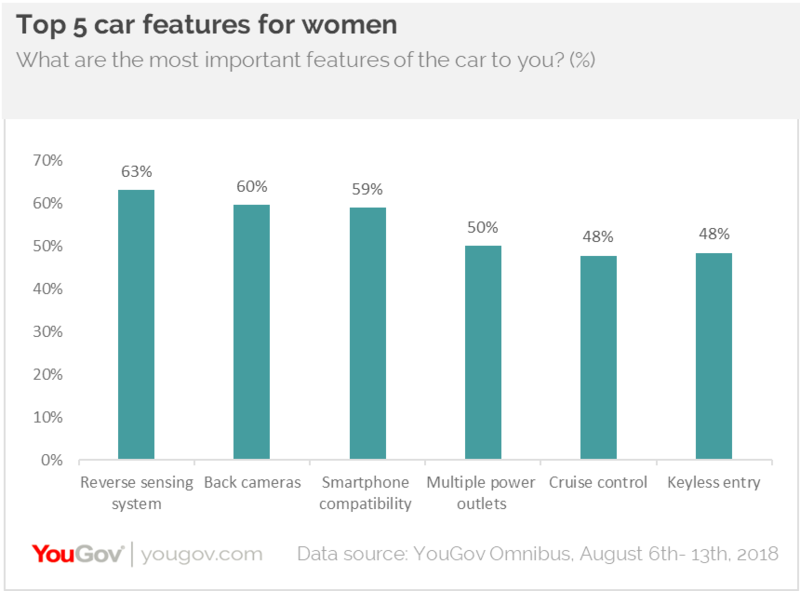 In terms of car features, once again the underlying fear factor is reinforced with safety topping the list of high priority features for women. Interestingly, for those who have already applied for a license, smartphone compatibility with calls, music, etc., was the feature which came out on top, suggesting these women are most likely early adopters of technology and confident to be the first in the market. 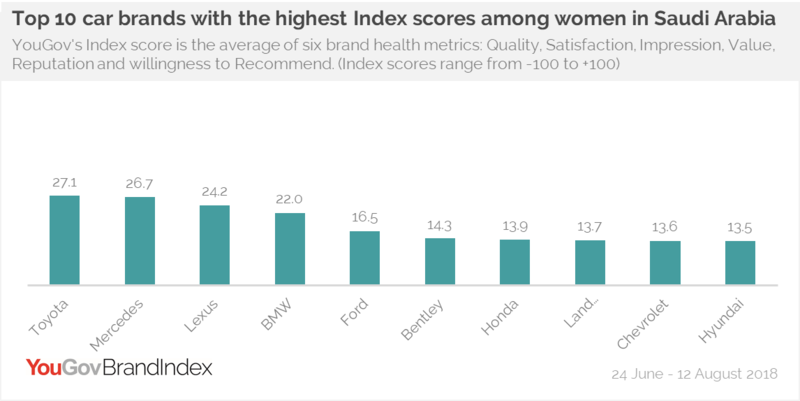 Looking at the time period since the ban was lifted, YouGov BrandIndex data reveals Toyota is the top car brand for women in Saudi Arabia with an Index score of 27.1, followed by Mercedes (26.7) and Lexus (24.2). Toyota is the market leader in the region. The brand has dedicated areas in the showroom to all female staff and set up women run call centres for enquiries. In addition, Attention (which measures the volume of respondents who have heard anything about the brand) for the same time period also shows Toyota to be in the top spot. Mercedes and Ford are in the second and third place respectively, suggesting these are the three brands which have achieved the greatest cut through among females in Saudi Arabia since the ban was lifted. Data collected online by YouGov Omnibus among 431 respondents in Saudi Arabia between 6th and 13th August 2018 using YouGov’s panel of over 6 million people worldwide and YouGov BrandIndex. Data is representative of the adult online population in the country.